In S07E01 - Dragonstone, the gates of Dragonstone open inwards. Why? Isn't it easier to ram down when it can be pushed open? The hinges are high enough to be inaccessible, and could easily be reinforced/hardened during wartime. This is an interesting physics problem. Counter intuitively, it looks like opening inward is actually stronger! From a strength perspective, it doesn't matter whether the doors open inward or outward. What matters is whether an attacker's actions cause tension or compression. 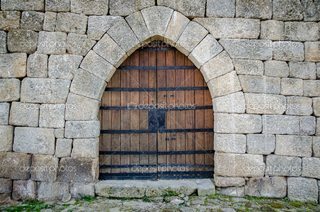 If you have the typical doors you see in castles, a battering ram hit causes tension - the wooden beams pull against each other to resist the ram. If you bow the doors out a bit, you can see that they cause compression instead. Trying to ram the doors causes the doors to try to close more, compressing all of the timbers. Different materials handle tension and compression in different ways. Concrete, for instance, is very good at compression loads but falls apart under tension loads. Accordingly, you'll always see concrete structures in compression. Look at a bridge, and you'll always see an arch to it, ensuring the whole bridge is in compression. So you definitely want a door structured so that battering rams cause tension. If you run the geometry, you see that it's really hard to have a door open outwards and exhibit tension under attack. This is how the castle doors/gates work in real life for various reasons. To open outwards, the hinges would need to be on the outside. Not an ideal design. It is easier to push gates closed against an enemy than to pull them closed. 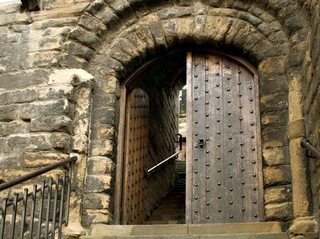 Doors that open inwards are always under the control of the castle and protected by the stonework. You can barricade the door from the inside with rubble to prevent access. In case of attack, the people closing the door are protected. Gates are usually barred, rather than locked, which needs to be inside the door and is easier if the gate opens towards the bar. For small doors which are thick relative to their size such as the hatch on an army tank it makes sense to open outwards. Castle doors are very large and relatively thin for their size. Since a battering ram places it's force in the middle of the door it will snap the timbers of both inward and outward opening doors equally well. 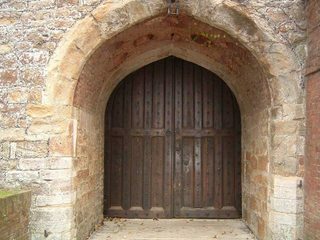 Most of the strength of these doors comes from the portcullis behind it and/or cross braces and other support timbers put in place during a siege not from which way they swing. So you might as well have them open inward to protect the edges of the door (which are considered the weakest part) and for the other reasons that amflare mentioned. Others have made good points, but I think the simplest explanation is probably this: large gates like that are usually barred, not (just) locked. You want to be able to bar and unbar the door from the inside, and for that to work, it has to open inward. In Star Wars: A New Hope, why was one officer dressed in white? Shouldn't Dragonstone's staircase have gates to be more effective? 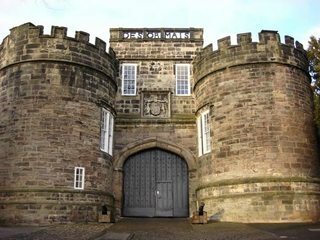 Why are castle gates in GoT generally double doors? Why did they shoot with burning arrows during the fight for Castle Black? How did Eddard Know the True Parentage of Joffrey, Tommen and Myrcella? Why isn't Jon executed on sight? How long would it take to do a recon dragon flight north of the wall?